I have a new product from Dance Legend for you today. Well I'm not actually sure how new it is, but it is certainly new to me. 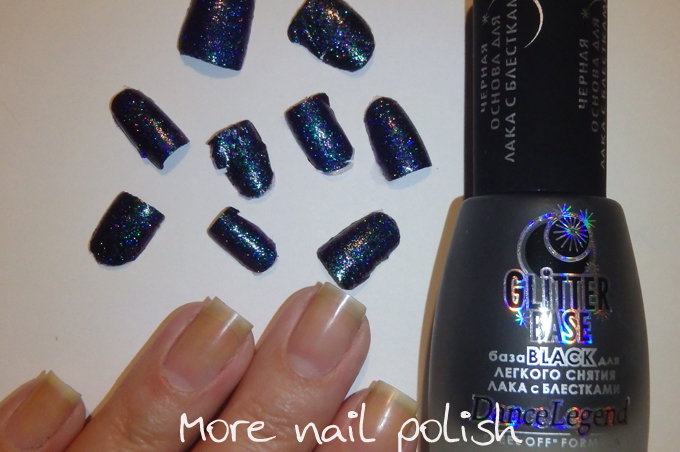 The product is Glitter Base and it's a black peel off base coat. The best way I can think of describing them is a cross between your blackest one coat black polish and a PVA glue peel of base coat. First lets look at the Glitter base on it's own. This is one coat on my bare nails. As you can see it's super glossy (note the sun and cloud in my nail reflection). Dry time is good, I'd say a little long that a regular polish. I waiting about 3-4 minutes before applying my polish on top of the base. I actually have used this several times. 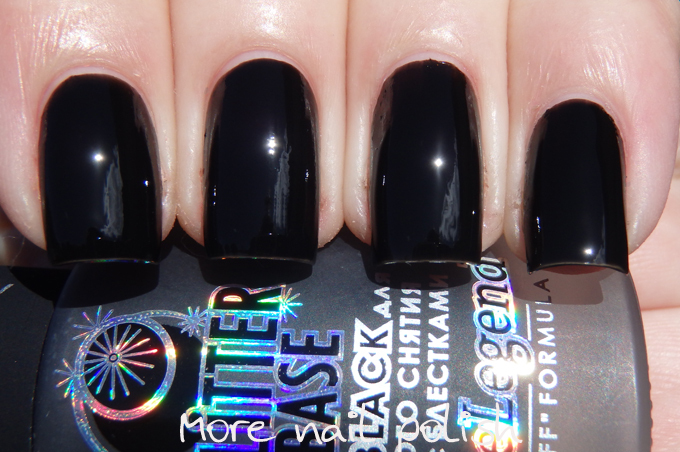 The first time was underneath Lacquistry Obsessed Holo. Below I wore it as a base for Lacquistry Amazeballz: Chunky Ballz. 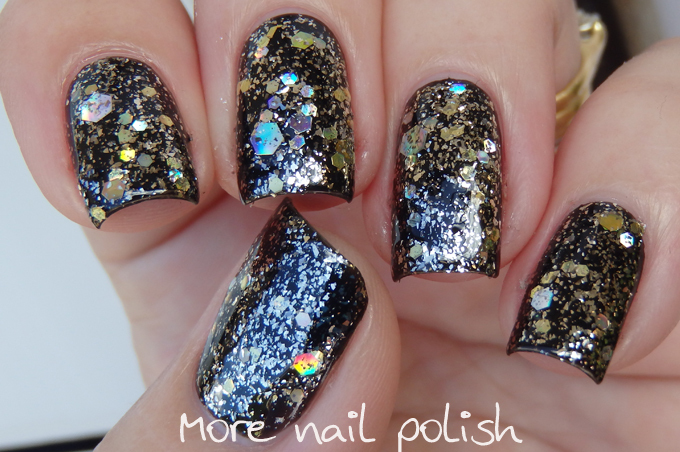 This is a single coat of Chunk Ballz with Seche Vite top coat. I forgot to photograph my Chunky Ballz removal, but I did remember to photograph the removal with Obsessed Holo. I removed this when in the shower at night, like I remove my PVA peel off base coat. Once you get an edge lifted it is really easy to remove an entire nail in one go. But just like PVA, it also lasts on the nail well if you don't pick at it. I am a big fan of this and think I will use it a lot. 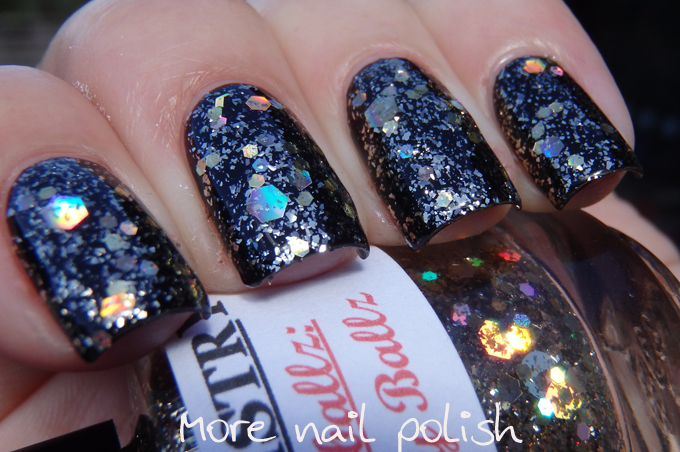 If I need a black base for something, whether it be a multichrome or glitter, I think I will reach for this first. I love how opaque it is on a single coat, and also how it self levels and drys so shiny and smooth. I have found that some polishes (particularly dark greens, blues and blacks) can really stain your nails if you wear a PVA base and then don't base coat. 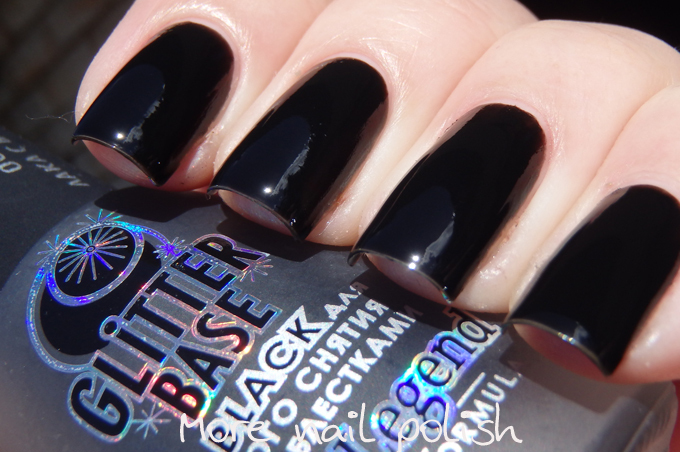 Using this black Glitter base when I want a black peel off base means I can replace three coats (PVA, base coat and black polish) with just one, so even though it takes a little longer, it's still faster, and it's ends up thinner on the nail. I recently placed an order with Dance Legend, via email through the PR contact and not through the website. I decided to take the risk with the post and see if my package makes it. If it does, hopefully it means they will open up the shop soon too. Glitter Base provided for consideration. This is such a great invention! wow, that really looks promising. I love how glossy it looks on its own and how it comes off in one big piece. That's interesting. I wonder if the weather helps, with it being hot and dry here and cold over where you are. Mine dried pretty quickly really. It would drive me nuts if I had to wait for 40 minutes! 40 minutes is way too long for my patience. It's a good point about the weather, so I shall give this another go once it gets warmer here, to see if it helps!